(I have hinted before I love collars ;) ). This dress can be made season appropriate by wearing it over tights and a nice pair of ankle boots and under a blazer...or a leather jacket would look nice. This kind of garment is a great twist to an outfit that you'll wear for a place that will be a bit warm for long sleeves but still looks autumnal with its browns, oranges and cranberries; typical autumn colours. 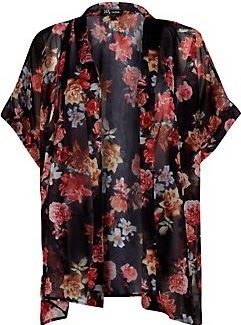 In a very similar tone of colours and print on this kimono is this velvet skirt. First of all, velvet is a material on trend this season. 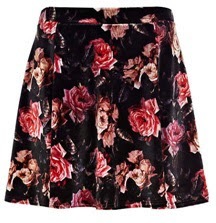 Secondly, how cute is this skirt? With a shirt or a collared top (of course :P) I just can see it happening. 3 comments on "A/W 13 - Trend Series #5"